Below are three astonishing experiments with DNA which proves that DNA can heal itself according to the “feelings” of the individual as reported recently by Gregg Braden. In his recent program entitled Healing Hearts/Healing Nations: The Science of Peace and the Power of Prayer, Gregg Braden discussed how in the past we lost huge amounts of information from ancient spiritual traditions (when the library at Alexandria burned we lost at least 532,000 documents), and that there may be information in those traditions which could help us understand some of the mysteries of science. To this end he reported on three very interesting experiments. Gregg Braden started off as a scientist and engineer, before he began pursuing these larger questions. The first experiment he reported was done by Dr.Vladimir Poponin, a quantum biologist. In this experiment, first a container was emptied (ie a vacuum was created within it), and then the only thing left in it were photons (particles of light). The third experiment was done by the Institute of Heart Math and the paper that was written about this was titled: Local and Non local Effects of Coherent Heart Frequencies on Conformational Changes of DNA. (Disregard the title! The info is incredible.) This is the experiment that relates directly to the anthrax situation. In this experiment, some human placenta DNA (the most pristine form of DNA) was placed in a container from which they could measure changes in the DNA. Twenty-eight vials of DNA were given (one each) to 28 trained researchers. Each researcher had been trained how to generate and FEEL feelings, and they each had strong emotions. What was discovered was that the DNA CHANGED ITS SHAPE according to the feelings of the researchers: 1. When the researchers FELT gratitude, love and appreciation, the DNA responded by RELAXING and the strands unwound. The length of the DNA became longer. 2. When the researchers FELT anger, fear, frustration, or stress, the DNA responded by TIGHTENING UP. It became shorter and SWITCHED OFF many of our DNA codes! If you’ve ever felt “shut down” by negative emotions, now you know why your body was equally shut down too. 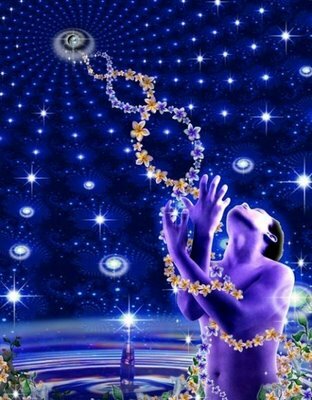 The shut down of the DNA codes was reversed and the codes were switched back on again when feelings of love, joy, gratitude and appreciation were felt by the researchers. This experiment was later followed up by testing HIV positive patients. They discovered that feelings of love, gratitude and appreciation created 300,000 TIMES the RESISTANCE they had without those feelings. So here’s the answer to what can help you stay well, no matter what dreadful virus or bacteria may be floating around. Stay in feelings of joy, love, gratitude and appreciation! This energy appears to be a TIGHTLY WOVEN WEB that connects all matter. Essentially we’re able to influence this web of creation through our VIBRATION.